Unlock the special student price for the 3-year VPN plan. Free public Wi-Fi networks at libraries and coffee shops are everyone’s best friend. And that includes hackers who love exploiting the weak security of such hotspots. What they don’t love is NordVPN, which protects all your internet connections with a wall of military-grade encryption. Schools and colleges often block various sites, such as Facebook, Twitter or YouTube, to keep your focus where it should be – on your studies. If you think you’re good without this extra step, NordVPN can help you. It changes your IP address and allows you to bypass any local firewall. Studying in a foreign country is as exciting as it gets until you start missing stuff from home. Like your favorite TV shows, which are for some reason unavailable where you are now. Again, NordVPN can solve this for you: just connect to a VPN server in your home country and enjoy! Many video and audio streaming services don’t work with VPNs that well. That’s a shame because they force you to choose between entertainment and security. Which means security doesn’t stand a chance. With NordVPN, you’ll never have to take sides – it works with hundreds of streaming services. 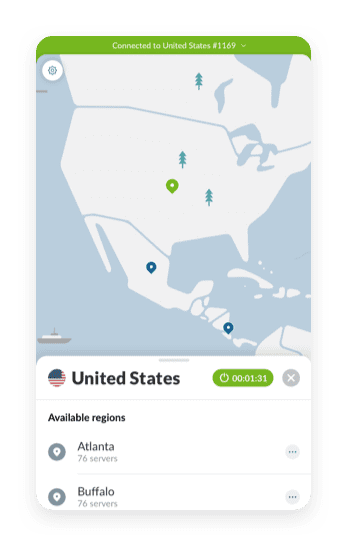 Connect up to 6 devices simultaneously with a single NordVPN account. Works on Linux, Windows, macOS, iOS, and Android.